【CONTAINS 6 CONNECTORS FOR 12-14 GAGE WIRE】 Will connect 3 low voltage outdoor lights. COMMERCIALLY RATED BEST LANDSCAPE CONNECTOR, Typical landscape wire connectors deteriorate from Sun and Weather, causing them to fail and require replacement. Modtek landscape lighting connectors are injected with high performance UV polymers combined with precision machined high strength steel alloy pins, that go through a second process of Zinc coating to ensure your landscape lights work perfectly for years into the future. Designed for a precision fit with both 12 or 14 gauge low voltage landscape wiring. Modtek high performance connectors are the perfect solution to replace all connectors used on wall mounts outdoor lights, Stem walkway lights, Up & downlight, path and patio deck lighting. Our connectors are designed specifically to work with Moonrays, Paradise, Hinkley, Kichler or Malibu, and many others. [INSTALLATION IS SIMPLE, NO] Splicing/Crimping or SPECIAL tools required! So well designed installation can be completed in just a few minutes! 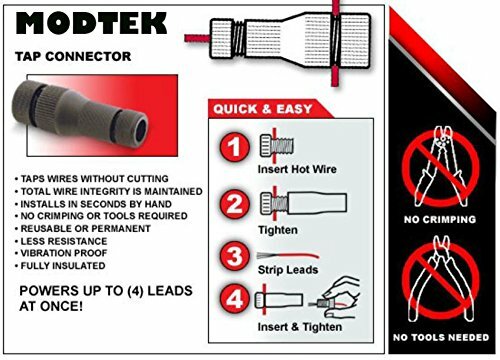 Modtek connectors tap wires without any tools, and provides a weather proof and high performance connection guaranteed! 【BUILT TO PERFORM OVER EXTENDED TIME PERIODS】 Modtek's connectors are designed to be reusable unlike push or pinch style connectors! Modtek pierce connectors are the end to poor connections! The end to flicking or bulb outages! 1 Year guarantee. Your100% satisfaction is our highest priority! Or your money back! If you have any questions about this product by Modtek, contact us by completing and submitting the form below. If you are looking for a specif part number, please include it with your message.